In his book, The Contradictions of Real Socialism, Michael Lebowitz offers a rigorous Marxist explanation of what went wrong in the USSR (and its allied countries). To Lebowitz (following Marx in this regard), a socialist society is one “that removes all obstacles to the full development of human beings” (p. 17). The countries of real socialism by contrast were caught in a tension between enterprise managers and planners and the vanguard which did not place human development first, thus ensuring its ultimate failure. Lebowitz’s approach is sweeping, thorough and fresh even while his work does raise several questions and problems. Lebowitz begins his starting analysis with what capitalism does to workers. To Lebowitz, workers are not merely “exploited within capitalist relations – they are also deformed” (p. 14). The deformation of workers, or their alienation, means that workers are robbed of their full humanity. Whereas, the ability to labour and create is what makes us human beings, workers see their labour turned against them to serve capital. The whole production process of capital degrades the worker by taking away his/her intellectual potential, turning the worker into an appendage of a machine (as Marx richly says in Capital). The end result of capital’s deformation of workers is that “thinking and doing become separate and hostile” (p. 15). What workers ultimately produce under capitalism is not for their benefit, but serves the profit and accumulation of the prevailing system. Yet the exploitation and alienation that workers suffer under capitalism means that they are compelled to resist, whether for higher wages, shorter hours, etc. However, these struggles often occur within the ideological framework of capital and push for fairness within the confines of that system. For Lebowitz (and Marx), it is not enough to know that capitalism is an exploitative and alienated system, rather workers need to get beyond capital. And that requires a socialist alternative where the development of human beings is the central goal and “it does not come as a gift from above” (p. 17). In other words, the emancipation of the working class is the task of the working class itself. Lebowitz's vision of socialism was laid out in another one of his books, The Socialist Alternative, where this concept is much more developed. However, in order to understand Lebowitz's critique of “real socialism”, it is necessary to briefly sketch out his vision of the socialist triangle and its goal. The socialist triangle is an “organic system of production, distribution, and consumption” (p. 19). The three parts of the triangle reinforce each other and build upon the strengths of solidarity cooperation and free development, as opposed to building upon the defects of capital such as alienation, wage differentials, profit in order produce new socialist human beings. The three portions of the triangle are identified as: (1) social ownership of the means of production, where workplaces are run democratically by the workers themselves; (2) social production organised by workers in order to build relations of cooperation and solidarity to develop their own human capabilities; (3) and the satisfaction of communal needs and purposes, where workers produce for the needs of all in order to continuously develop their capabilities. As stressed above, this vision of socialism is one that “places human development at its core and insists that people develop through their activity” (p. 160). In order for “a society of associated producers to be developed, however, the elements of the old society must be subordinated” (p. 160). This means that capitalist social relations should not be reinforced or built upon, but be subordinated to the development of the socialist triangle. While socialism points toward the full development of human potential, Lebowitz asks of real socialism, what type of people is produced within it? To him, it clear that not all the characteristics of real socialism “point in the direction of the society of associated producers. One that does not is their orientation toward self-interest” (p. 163). The workers of real socialism were living in societies that produced their own logic that led in this way. Real socialism had its own socialist triangle: (1) that of the enterprise managers, (2) the vanguard (3) and the moral economy of the working class. Let us now outline the triangle of real socialism in order to see why the system was bound to lead back to capitalism. Let us begin with the enterprise managers, who operated according to a single centralised national plan in which the necessary goods for other firms and consumers were produced. The ultimate success of the plan “depends upon the success of the individual enterprises” (p. 40). In order to encourage the managers of these enterprises to produce, the planners stressed “that the managers were motivated by material interest -- that is, the managers acted as if they wanted to maximize their personal incomes in the present and the future” (p. 41). If material incentives were the motivator for an enterprise manager, then if a manager fulfilled their production target, they would receive a bonus which was “not a negligible part of the income of the mangers” (p. 41). Planners and managers wanted to make sure that plans were 100 per cent fulfilled. Managers did everything “possible to secure their bonuses” (p. 43). To this end, managers hoarded materials and workers, bribed officials and engaged in the underground economy. Enterprises also cut corners in the production of goods in order to stockpile for the future and to meet their production quotas, resulting in the production of inferior products. Plan targets were kept artificially low so that the enterprises could easily overfill their targets and receive their bonuses. The end result of this was that the economies of real socialism had acute shortages and inferior goods. Lebowitz rightfully points out that the managers wished to maximise their income, but they weren’t capitalists. Managers “didn't own the means of production, didn't have the power to compel the workers to perform surplus labor, and didn't own commodities (as a result of the labor process) that could be exchanged to realize surplus value which can be the basis for the accumulation of f capital... In short, we do not find here capitalist relations of production” (p. 90). Clearly, Lebowitz does not accept the theories of state capitalism in regard to the Eastern bloc, but he hastens to add that they did “contain within them the logic of capital” (p. 90). If the managers were able to remove the restraints placed upon them -- specified production quotas, the inability to fire workers, designated suppliers and replacing the plan for free markets -- then they would operate as capitalists. However, the logic of capital (or the planners) was confronted by another side of the real socialist triangle, that of the vanguard party. To Lebowitz, the vanguard party was guided by the need to develop communism, which was premised on “the development of productive forces” (p. 69). And if communism is the goal of this development of the productive forces, then naturally faster growth was called for. And to achieve communism, the monolithic disciplined vanguard party needs to be in control of the state apparatus to coordinate production, unite the working class and lead the way. In order to build socialism and communism, the “the party must have the power to do so. It must control the state -- and there is no logical basis for sharing power with other parties or for relinquishing it voluntarily” (p. 76). Thus the need for state power and from that flows a central plan encouraging the greatest possible growth to achieve communism. It is easy to say that the picture of communism believed by these vanguard parties was simplistic. Yet there were dedicated party members who stressed “the importance of placing social interests above personally interests, setting an example of sensitivity and human solidarity … and holding high the principles of internationalist unity and cooperation” (p. 71). Certainly, there was an element of privileges and self-interest that existed among members of the ruling vanguard party, but Lebowitz says of the communist ideal, “how could this not attract the best, the most idealistic young people within society?” (p. 71). However, the vanguard parties of real socialism were top-down, commandist and hierarchical. Their behaviour in the planning process was not to encourage the self-activity of the working class, “with its characteristic reliance upon centralized organization, control, and intervention flows directly from the vanguard relation -- that relation in which the top/centre asserts the correctness of direction from above and commands compliance” (p. 80). However, in order for the vanguard to direct the economy, it “must be certain that all the information it requires for planning is transmitted accurately from below and consolidated ... and all this must be done in a timely manner without the individual players being able to deviate from the score” (p. 81). As we have seen when describing managers above, the nature of the system made sure perfect functioning was impossible. We should not rigidly separate the planners from the vanguard party; there was a great deal of overlap and penetration between them. The planners (embodying the logic of capital) and the vanguard (representing the logic of command), each with their respective logic, interacted to “deform each other. Rather than the combination permitting the best of both worlds, the effect can be the worst of all possible worlds” (p. 91). The system was dysfunctional, with managers striving to throw off the centralised plan to become the capitalists that they were in embryo. Managers wanted to gain property rights over their enterprises and thus state ownership of production and distribution had to be thrown off. In this situation the party may have continued to attract the best in society, but “it may also get the worst. The tendency to seek party membership (and to stimulate the appropriate behavior) may be increasingly based on potential for career advances and securing special advantages” (p. 130). In the face of declining growth rates into the 1980s, the tension of this contested and dysfunctional system grew so great that a portion of the party liquidated state ownership of the means of production and reverted to capitalism. However, this is not the end of the story. There is one more side of the real socialist triangle and that is the moral economy of the working class. For the workers of the Eastern bloc there was guaranteed full employment and “the protection that individual workers had for their jobs from trade unions and the legal system was real” (p. 60). Still, trade unions and the legal process operated in a top-down manner that left workers atomised. The planners were constrained from reaching their production targets by a system of full employment and sought to liquidate it in the interests of efficiency. This meant that there was a de-facto alliance between workers and the vanguard party. For workers, the party’s stress on economic growth and protection and state ownership ensured them employment and benefits. Yet this alliance saw “the working class yield control over its labor power in return for a package that is far better than it could expect to receive within capitalism” (p. 75). The working class had no power and “is one of an atomized yet secure workforce” (63). Workers thus had a sense of fairness and entitlement to the rights that real socialism guaranteed them and “production under vanguard relations produc[ed] a working class consistent with vanguard relations” (p. 149). The workers sought to enforce their norms of fairness within the system’s framework, or their “moral economy”, as Lebowitz calls it, but they did not seek to change the overall system. If the workers’ norms were not enforced, they would steal from their jobs, work slowly and buy from the underground economy. In a sense, the workers of real socialism had not escaped the alienation of capital. It is well known what the fate of real socialism was. When Mikhail Gorbachev came to power in the Soviet Union, his program of “perestroika thus meant that the managers would be successful in wrestling clear property rights over the enterprises from the vanguard” (p. 127). Furthermore, in the name of efficiency, the right to full employment and the social safety net was abolished. The vanguard parties of real socialism thus accepted the arguments of neoliberalism and led their societies back to capitalism. Yet it remains to be answered why the working class was unable to resist this assault? As Lebowitz says, “the vanguard speaks on behalf of the working class. Any attempts by workers to organize independently of the official channels appointed to represent them were repressed. Without space for autonomous organization or, indeed, effective communication among themselves, workers in the Soviet Union were disarmed in the ideological struggle” (p. 131). This prevented the emergence of workers’ councils which Lebowitz believes could have averted the transition back to capitalism. And finally workers were also alienated and atomised under vanguard relations. The end result of vanguard relations on workers, Lebowtiz sums up as “negative in any accounting system that values human development” (p. 149). 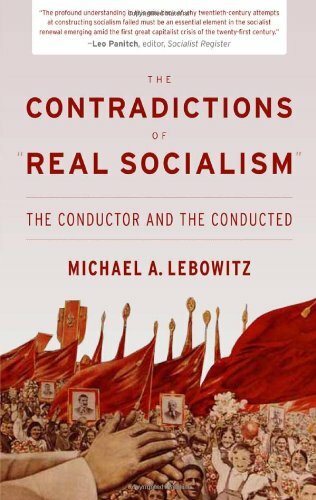 Lebowitz’s analysis of the problems and contradictions of real socialism is quite refreshing. This writer for one sees very little to object to in the overall work. To any revolutionary desiring to understand what went wrong in the last century and seeking to build a new socialism, The Contradictions of Real Socialism is utterly essential. That being said, there are a number of questions that come to mind after reading Lebowitz’s work. First, Lebowitz doesn’t address a question that all socialist countries (real or otherwise) have had to deal with: military defence. It is an indisputable fact that every socialist revolution since 1917 has faced armed intervention from the capitalist powers, counter-revolutionary terrorism and subversion. No socialist government has ever been given a day’s respite from these threats. In order to meet the reality of counterrevolutionary intervention, a state is also needed to coordinate other activities such as the economy, security, education, health care, communications, trade, diplomacy and if necessary, military action on an external basis. Any revolution for the foreseeable future will have to operate in a world dominated by imperialism, which imposes certain conditions. Even with the best of intentions, any socialist state would thus have to maintain some form of hierarchy or chain of command if only as a matter of necessity against the capitalist enemy. The need to maintain revolutionary defence (with the dangers of commandism and bureaucracy) is not something that revolutionaries can just walk around, these are contradictions that have be gone through. Perhaps this is something that Lebowitz can follow up in a later work. Second, Lebowtiz has written here about the USSR and the Eastern bloc and in other places about Cuba and Venezuela, but he neglects to discuss China. This raises some questions: what does Lebowitz have to say about the socialism of Mao? There is also the question about a comparative approach of the USSR to China, which is not touched on here. This is not a detriment to this book, which is focused on the Eastern bloc, but it would be interesting for Lebowitz to extend his analysis to other attempts at socialism. A third question raised by Lebowitz’s work is that of the role of a revolutionary party. He says that he is not opposed to “the necessity for leadership in the struggle against capital or to build a new socialist society” (p. 186). It would be unfair to view Lenin's revolutionary vanguard party as the same as those that governed the real socialist countries of the 1970s or 1980s. While the ruling parties of real socialism were hierarchical and commandist, Lenin's party shows a different style of leadership. It was an organisation that could learn and teach, always keeping the communist goal in mind and remaining deeply connected to the working class. In 1917, this party was incredibly receptive to the demands of the masses and was able to win leadership of the Russian Revolution. Just a cursory look at the works of Neil Harding, Lars Lih, Alexander Rabinowitch, Paul Le Blanc or my own shows a different style of a vanguard than the one Lebowitz describes. Now it is true that Lebowitz says he isn’t touching on these issues in The Contradictions of Real Socialism, but it would be interesting to see how the role of a party (or leadership generally) will figure in future socialist attempts. That being said, this writer has no objection to Lebowitz’s description of the “vanguards” of real socialism. Lebowitz's analysis has certain affinities with those of Leon Trotsky’s Revolution Betrayed, who saw the state ownership of the means of production in the USSR as reason for characterising it a (degenerated) workers’ state, while the bourgeois method of distribution and the great inequality (as embodied in the bureaucracy) threatened to lead the USSR back to capitalism unless halted by a political revolution. While Lebowitz’s and Trotsky’s analyses have a great deal in common (both are opposed to theories of state capitalism), Lebowitz’s stress on the alienated nature of vanguard relations of production means that he sees a social revolution as the only way out for the workers of real socialism as opposed to Trotsky’s call for a political revolution. However, there may be more common ground between the two, since Trotsky believed that a political revolution in the USSR would have profound social content. It is hard to give a final analysis of Lebowitz’s study of the vanguard relations of production. For one, Lebowitz is looking at “real socialism” from 1950 to its dissolution and thus his focus “is upon the system which was more or less consolidated and stable rather than the original emergence of that system” (p. 30). This is not to hold anything against Lebowitz. Yet one of the strengths of Trotsky's account (or that of Charles Bettelheim) of the USSR is its historical nature. Trotsky and Bettelheim discuss in great detail how the particular social formation of the USSR emerged and how it functioned. Whatever the merits or deficiencies of their respective analyses, they have a firm grounding in history. Lebowitz has promised to follow up The Contradictions of Real Socialism with a discussion of the history of how the vanguard relations of production emerged and this writer eagerly awaits its publication. Even though The Contradictions of Real Socialism raises certain questions, has certain problems in its analysis and is incomplete, it is absolutely worth reading. Lebowitz has made a valuable contribution to our understanding of the Soviet experience. For revolutionaries who want to build a socialism that is an alternative to the misery of capitalism, while also learning from the mistakes of the past, this is a highly recommended work.